I have been going through some pictures I took (well, had taken) of my NL beer bottle collection and I noticed that I had a great lineage of Blue Star bottles. So, why not take a look at how they’ve changed over the years? It’s a heavy bottomed glass bottle (thicker than today’s vintage, unless you drink Steamwhistle) with a shiny gold label. It’s the same label I have over on the overview, but this one is still attached to the bottle, which is a plus! It’s still from the Bavarian Brewing era, so it’s likely from sometime prior to, or just slightly after, 1962. This bottle is likely from the 1970s, the era of the stubby. The label hasn’t changed too much, but the red strip has moved into the background and the tag line “The Star of Newfoundland” has been added. It still has the iconic “Gold Medal of Leadership” from Munich in 1954 which is now, as it was then, a pretty cheesy thing to put on a beer bottle. 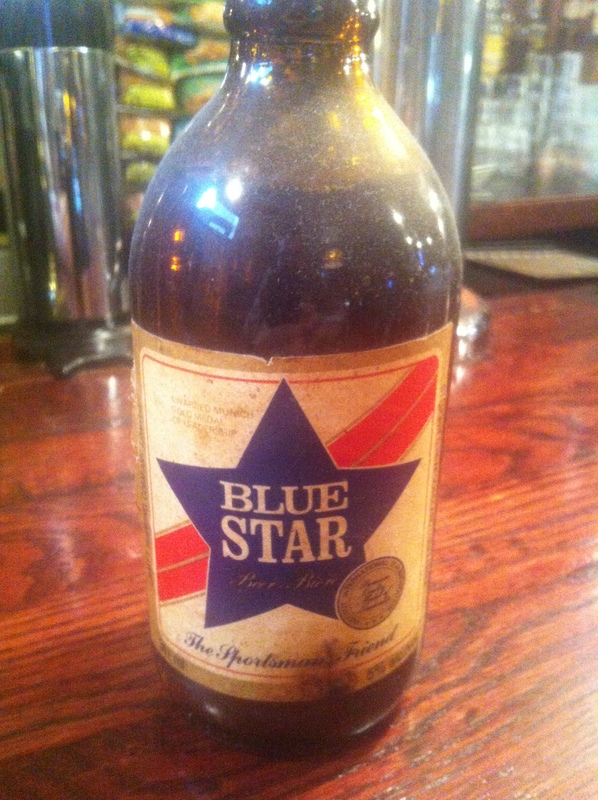 In a longer post I discussed this Blue Star bottle, still full of beer, that’s at the Duke of Duckworth in St. John’s. I dated it from the early 1980s, near the end of the stubby era, because it was kept at the bar (I figured they kept it as a novelty once stubbys became more rare). My dating here is guesswork, so I’m not sure when the phrase “The Sportsman’s Friend” came into use. Was “The Star of Newfoundland” first, or was it “The Sportsman’s Friend?” Right now, I’m not sure. I sure do wish I had a copy that said “The Sportsman’s Friend” though! 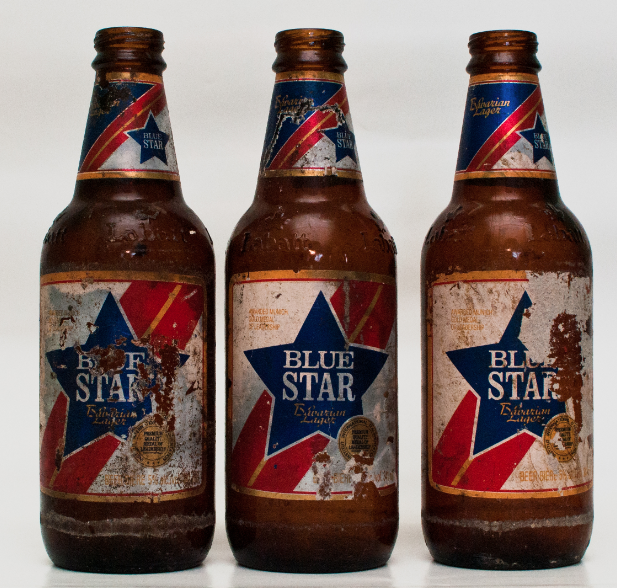 Three 1980s Blue Star bottles, my collection. Continuing into the 1980s we see that Blue Star, out of the stubby phase, is now into more common looking Newfoundland short necks. These are embossed with “Labatt” and were found in a shed in New Chelsea in the Summer of 2012 (thanks to Keith Cooke!). They’re in rough shape, but they show the same kind of label design as before, with the red strip and the bright blue star. They do look very 80s though, don’t they? 2012 Blue Star bottle, my collection. Which brings us to today. The 2012 version of the bottle, which uses a design from the early 1990s, has the red stripe from the background transformed into Christopher Pratt’s Newfoundland provincial flag. The gold border has been replaced with the gold of the arrow in the flag (pointing to a “brighter future“) and the star has received some stylistic shading. At that time, there was only one other product that had positioned itself as an indigenous brand of beer and that was Molson’s Black Horse. Its advertising focused on young beer drinkers and their lifestyles as students, partygoers, nightlife enthusiasts and so on – it was the Molson Canadian of Newfoundland. 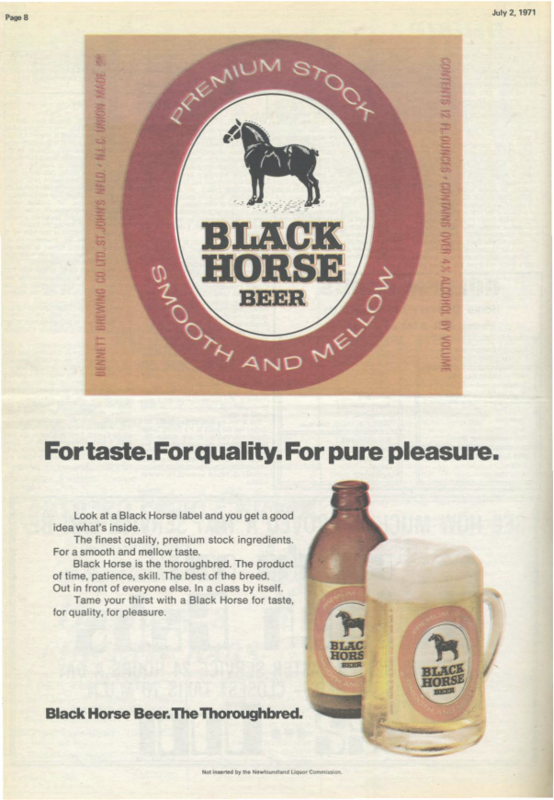 It should be noted that while Black Horse was known to be local in origin, the advertising was seen by many to be an imitation of mainstream North American beer advertising. 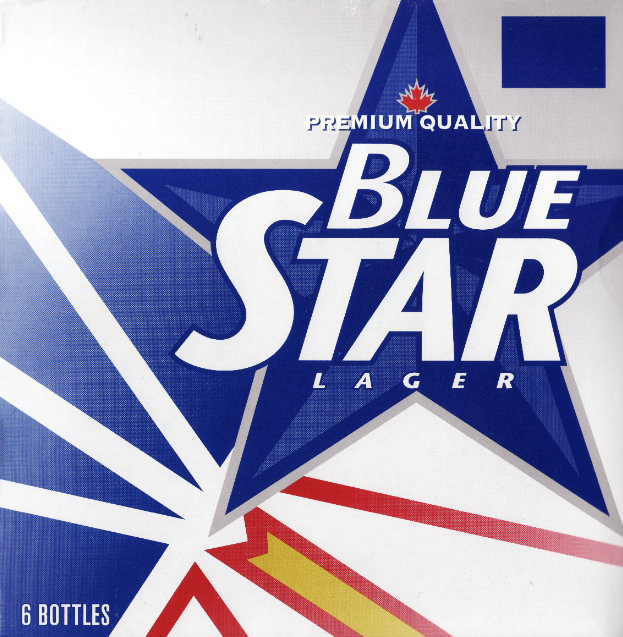 As a result, this gave Labatt an opportunity to reposition Blue Star as the true local brew, with a positioning statement for Blue Star best expressed as: ‘Blue Star is the ultimate Newfoundland beer, for Newfoundlanders, by Newfoundlanders’. Blue Star was positioned as ‘The Shining Star Of The Granite Planet’, a copy line that embraces the beers’ quality, its local origins, and stresses the ironic sense of humour. Tactically, we wanted to be as different from Black Horse as possible: humour versus music, radio versus TV, local versus mainland imagery. Creatively, the radio spots played up the local sense of humour and downplayed the beverage qualities. The commercials had the tag line ‘Blue Star, The Shining Star Of The Granite Planet’. Together, Blue Star and Blue Star Glacier Cold are now slowly but surely chipping away at Molson’s dominance in Newfoundland’s young adult market, while spending only a fraction of what the competition does, and not cannibalizing other Labatt brands. Blue Star Glacier Cold? It was one of those “ice” early-90s fad beers. What did it look like? This website has an image, but, from what I understand, it was a short lived product (really, any beer advertising itself as pasteurized has lost my confidence). That brings us through the aesthetic changes to Blue Star over the last 50 years. Did the taste change? Did the quality? Those are much harder questions to answer. 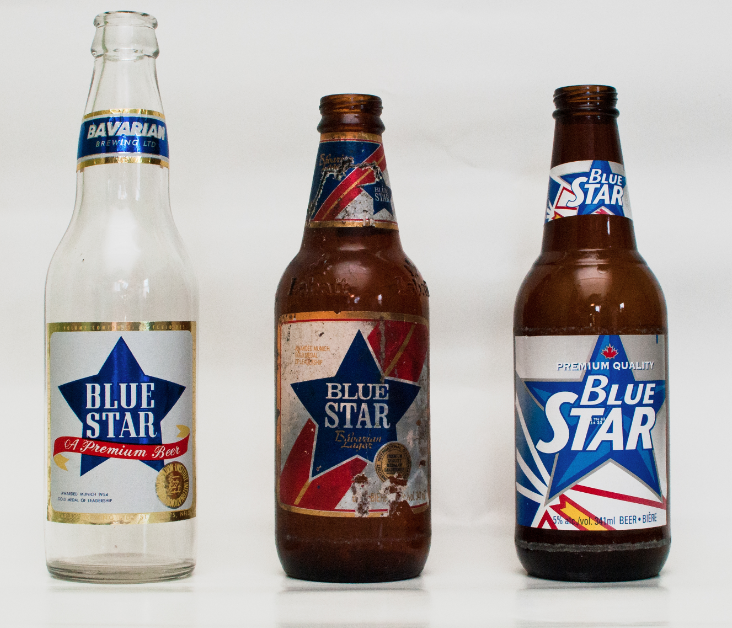 A diehard Blue Star drinker might not notice subtle changes over many years, while other might just say it always wasn’t very good (non-Blue Star drinkers, obviously). That’s the tricky thing about beer history, it’s a temporary product which leaves little trace. Even bottles rarely survive. Remember to enjoy the beers you enjoy now, for who knows how history will treat them. Blue Star Evolution, 1960s to 2012. My collection. Bonus! From youtube user lambchops71, a radio add from the early 1990s “shining star” series. 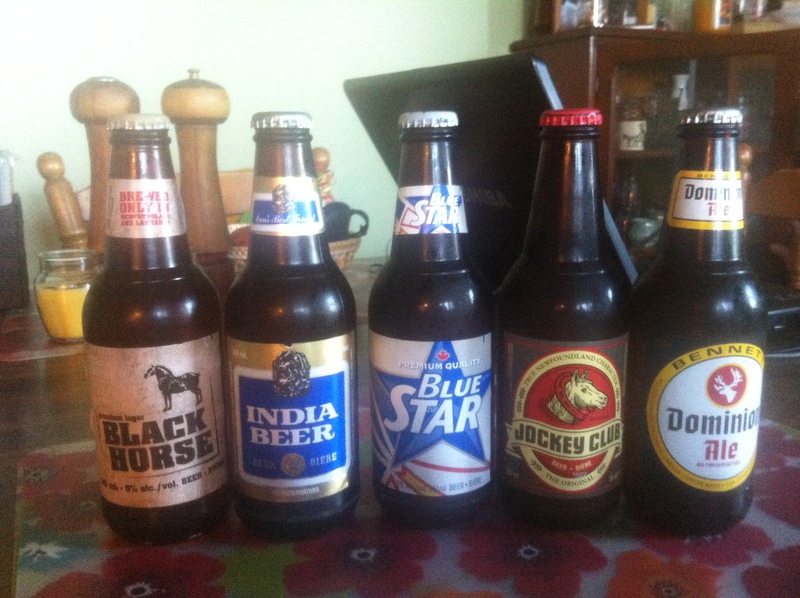 Before I talk about these beers I should note that this is just about the brands made by Molson and Labatt. If you are interested in the other brewers in Newfoundland, the craft brewers and brew-pubs, then check out Quidi Vidi Brewing, Storm Brewing, and Yellowbelly. That’s all the craft beer in the provence! If you’re looking for “real ale” (cask ale) or anything that keeps up with North American Craft beer (or even a year-round IPA), you’re going to have to wait a few years. 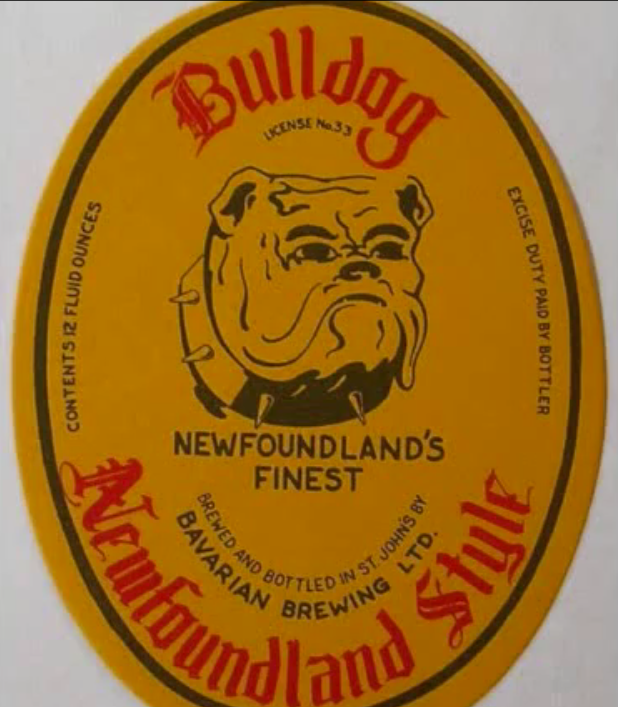 This post is intended as an introduction to the old Newfoundland Beer Brands, what I like to call “nostalgia marcos.” They are beers brewed by the big brewers (Molson and Labatt) but that throw back to an older brewery or brand. This is not unusual in the brewing world. Latrobe Brewing, known for their Rolling Rock lager, is a brand belonging to Anheuser-Busch InBev. Alexander Keith’s is Labatt’s. Even Labatt’s beer (like Blue) are really a brand of Anheuser–Busch InBev, so there are a lot of what historians call “invented traditions” in the beer industry. Brewers, big and small alike, like to connect their beer drinkers with the long history of beer brewing. In Newfoundland these nostalgia marcos are legendary. There are five remaining brands (two beloning to Labatt and three belonging to Molson) and almost every Newfoundlander you will ever meet will have one that they champion over the others. If your here visiting it might be worth trying some of these beers, but if your a visiting beer geek I doubt you’ll be impressed (these are brewed by the big brewers). On to the beers! 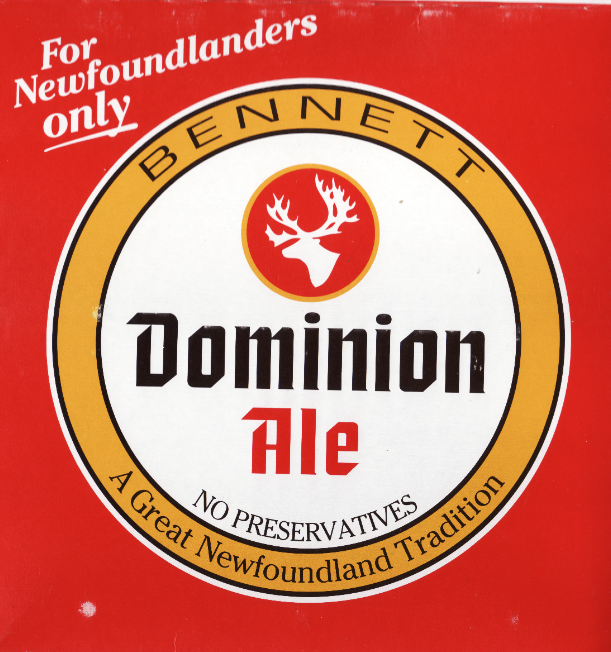 There are five traditional Newfoundland brands still being brewed: Bennett Dominion Ale, India Beer, Black Horse, Blue Star, and Jockey Club. In terms of taste and apparence they are pretty close and they are all, pretty much, fizzy yellow lagers. They come in 6 and 12 packs of semi-longneck bottles (about in inch shorter than mainland longneck bottles) which are all twist off. 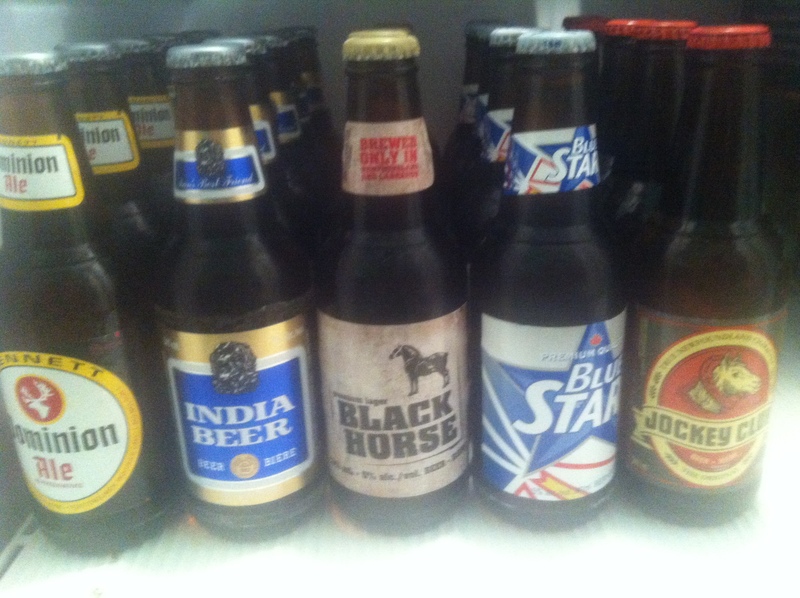 Blue Star, Jockey, and Black Horse all have their own printed caps, with Jockey having two different logos on the cap (either the Horse or the beer name), while India and Dominion simply have Molson caps. 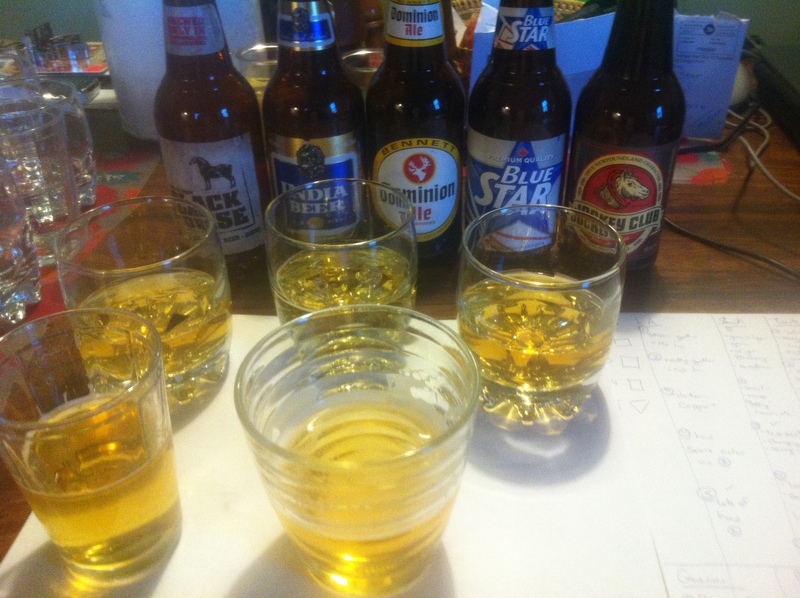 From my blind taste test. Lets talk about Bennett Dominion Ale first. India Beer Box Art circa 2012. Molson also brews the beer that was all the rage in the downtown music scene a few years back, India Beer. 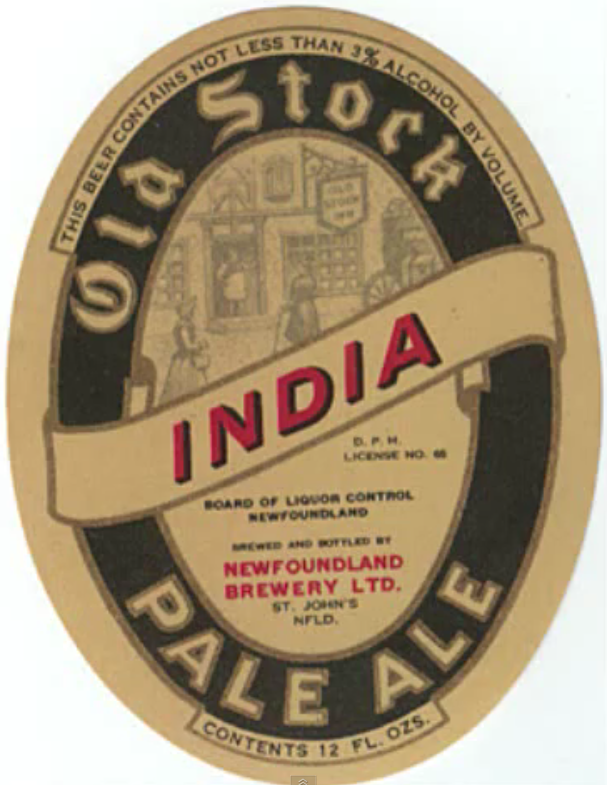 This beer, which is NOT an India Pale Ale, was brewed by the Newfoundland Brewing Company alongside their India Pale Ale. Both existed, but, as I understand, this was the lighter version. Generally people I’ve talked to describe it as a sweeter lager. Blue Star Box Art circa 2012. 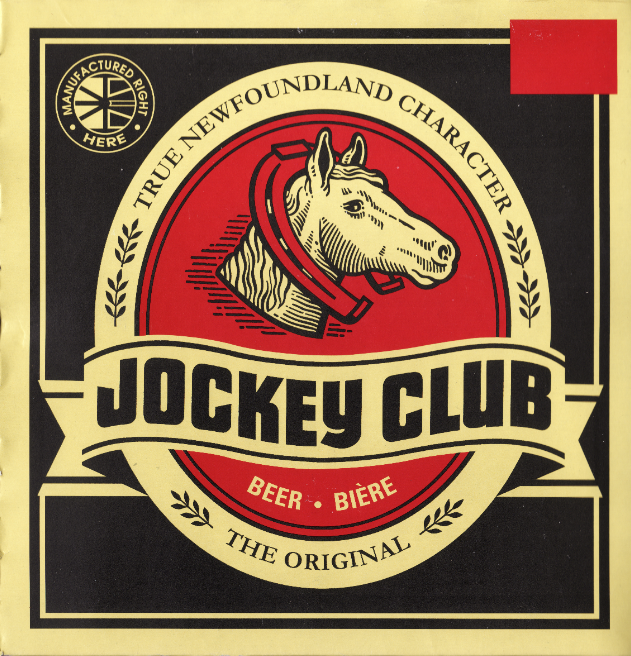 Jockey Club Box Art circa 2012. Labatt bought the Bavarian Brewing company and still brew two of their brands, Blue Star and Jockey Club. These are the two that I find the most distinct. 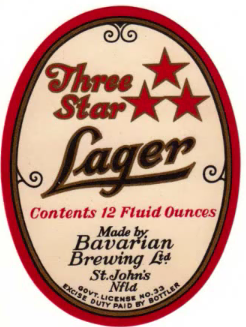 As a lager, Blue Star is light and clean tasting, while Jockey Club (which is still a lager or, if it is an ale, a lagered or very light one) is slightly more flavour-full. 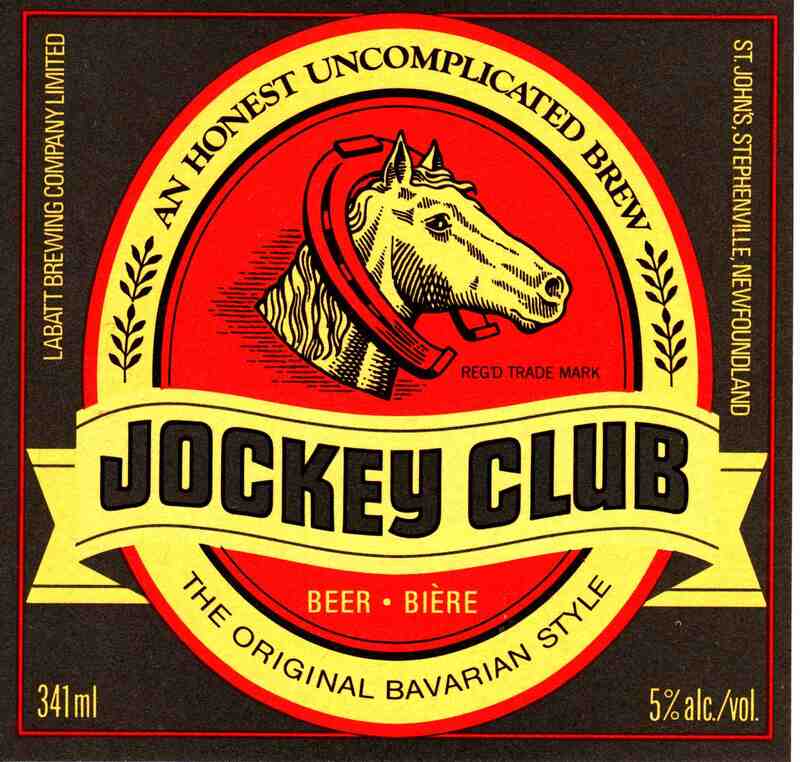 Jockey Club was advertised as the “champagne of beers” back in the Bavarian days, and, if you look really hard, you might pick up notes of cheap sparkling wine. Blue Star has a big dedicated following, particularly vocal since it was rebranded with the Newfoundland Flag in the early 1990s, while Jockey Club is often considered a bit of a joke. In two rounds of blind taste tests between these five beers I ended up preferring Jockey over the others (I usually drink double IPAs and Imperial Stouts), so take that for what it’s worth! 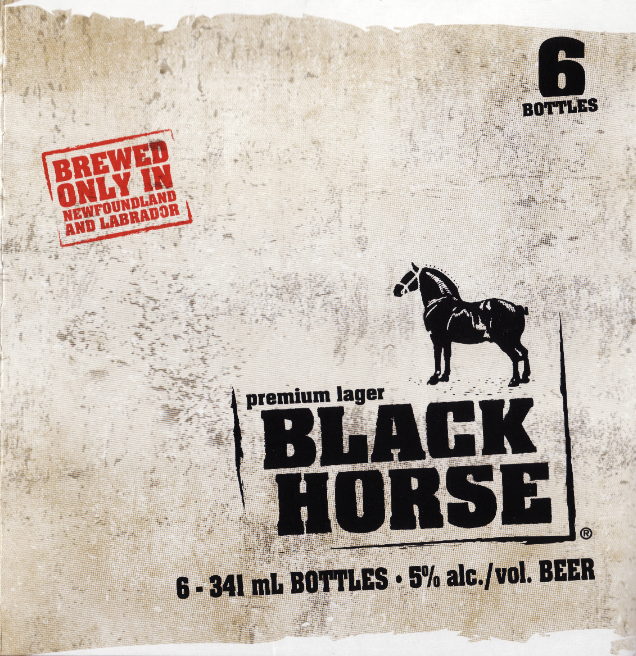 Black Horse Lager Box Art circa 2012. The best for last. 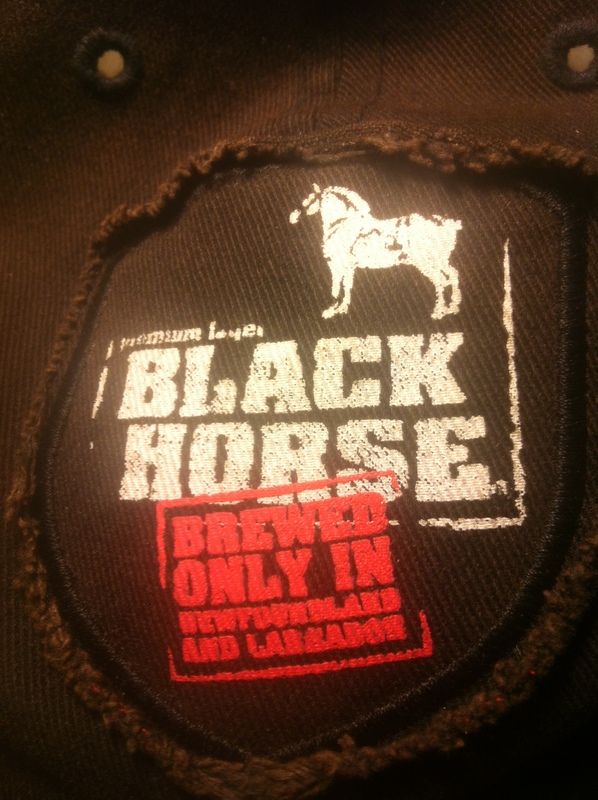 Not that it’s the best beer, but the 2010 redesign of Black Horse is really interesting for a historical point of view (the horse, which is the iconic part and on many labels on this site, now has a Newfoundland and Labrador shaped shadow on its body right before the hind legs). I mean, Black Horse Ale, as a brand, was one of the biggest in North America. It’d put Molson Canadian to shame. 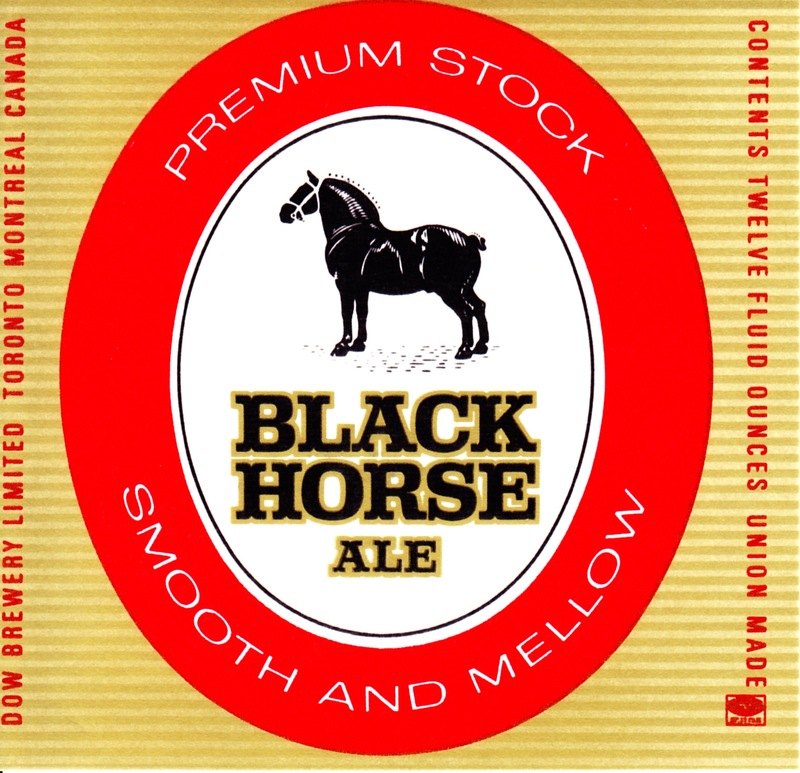 The Newfoundland version (which came with Carling-O’Keefe in 1962) has changed from an ale to a “premium” lager (more on this here), but the iconic black horse is still proudly on the label. It’s one of the most interesting to me, especially as they proudly say “Brewed only in Newfoundland and Labrador” when really it’s a mainlander who came here in the 1960s. There is no way you know his grandfather. Those are the five current Newfoundland Beer Brands made by Labatt and Molson. I should note that O-Keefe Extra Old Stock was discontinued here in 2009 (it’s another beer of mainland origin), so that’s not included. These beers are great reminders of the brewing heritage in Newfoundland that was deeply rooted in independent brewers. While they might not be exciting to beer-geek tastes they are something to try when your here. If you do see them anywhere else in Canada it’s likely because of a high concentration of Newfoundlanders (like in Alberta) who still swear by their favorite brands. Will they ever get wider distribution? It’s doubtful, but then again, Labatt’s nostalgia brand in Nova Scotia, Alexander Keiths, is now a North American faux-craft beer, so anythings possible. But if you are here and looking for beers to drink be sure not to forget our craft brewers! They are writing the future of beer in Newfoundland. I love adding more historical Newfoundland beer bottle labels to my collection and this one is no exception. Today I finally got a copy (two actually) of this Jockey Club label. The site I picked this up from states that its from the 1960s and was old stock that was never used. 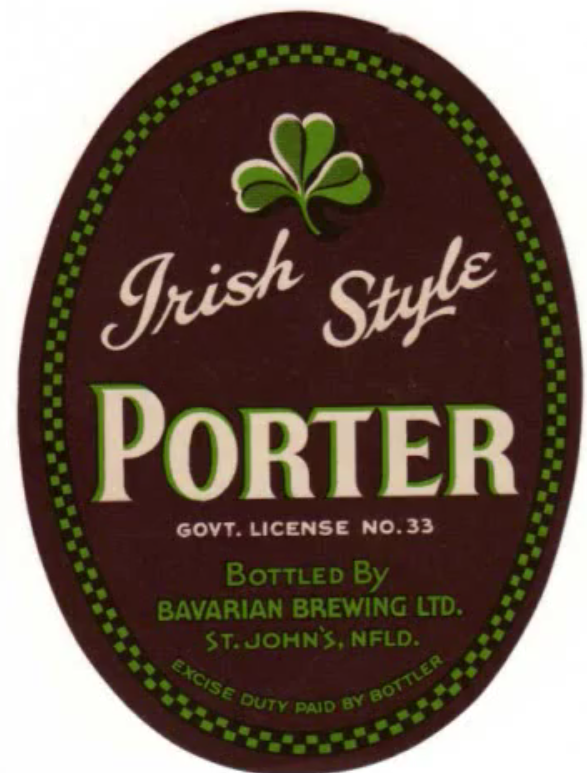 The date seems to be fairly believable (at least for our purposes), as it would be after the 1962 buy-out of the Bavarian Brewing Company Limited by Labatt, however, because the label lists Stephenville as part of the Labatt’s brewing organization this is likely from the 1970s. 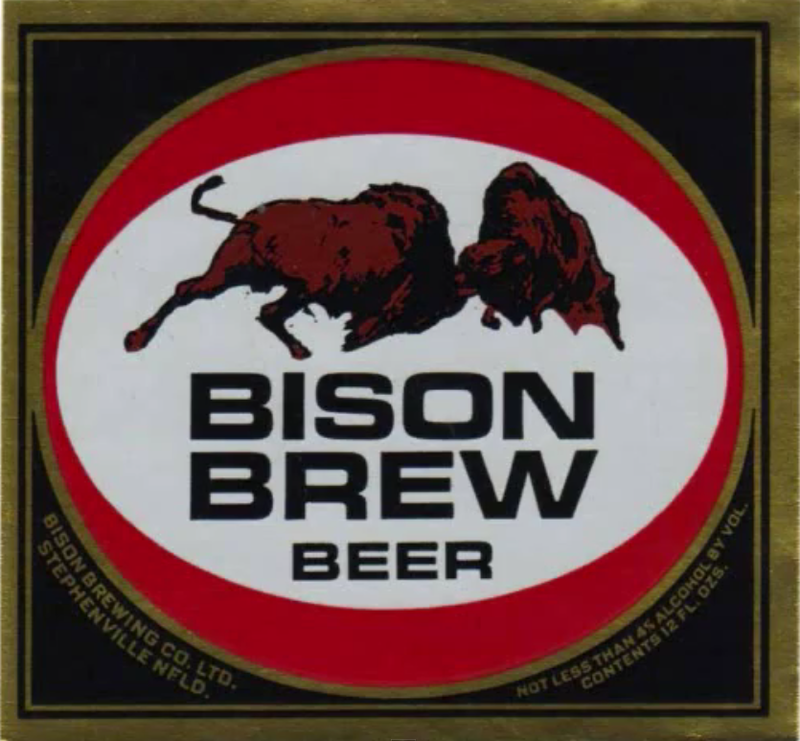 Labatt took control of the old Bison Brewing Company brewery in 1974 and operated there until 1981, so it’s probable that this label comes from the late 1970s when Labatt had two operations in the province. Dating the label aside, from my understanding this slogan “An Honest Uncomplicated Brew, the Original Bavarian Style” (which is great, isn’t it?) was used from the 1960s until the early 1990s when it was changed to “True Newfoundland Character” (this would be around the time Labatt rebranded Blue Star to be adorned with the Newfoundland Flag and ran the “Shining Star of the Granite Planet” series of advertisements”). I like to think that the “Bavarian Style” they are referring to has more to do with the Bavarian Brewery, who they inherited the beer from, rather than the area of Germany where the Bavarian Brewery got its name. Either way, it’s a great label which I’m quite happy to have a copy of! Black Horse Beer. The Thoroughbred? It’s a great advertisement, not only because it’s full of great copy about Black Horse, but also because it gives us a close up of the label. 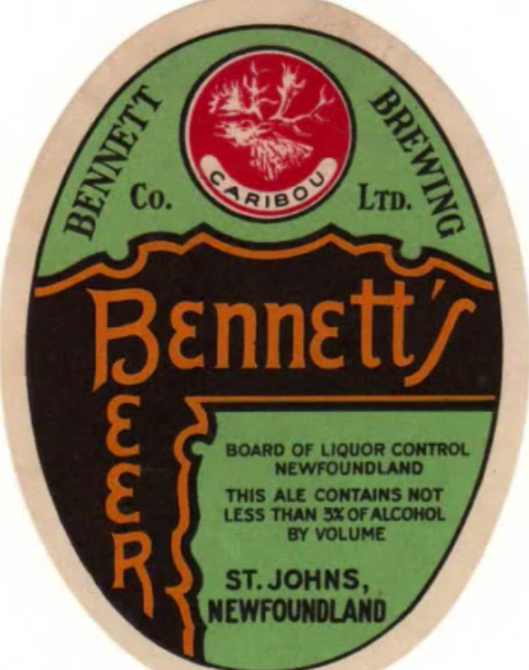 It still says it’s brewed by Bennett Brewing, which at the time was under the ownership of Canadian Breweries Limited (who gained control over the prestigious Black Horse brand after their 1952 purchase of National Breweries – which they renamed Dow Breweries). In all other ways the label is identical to the Canadian Black Horse Ale label. 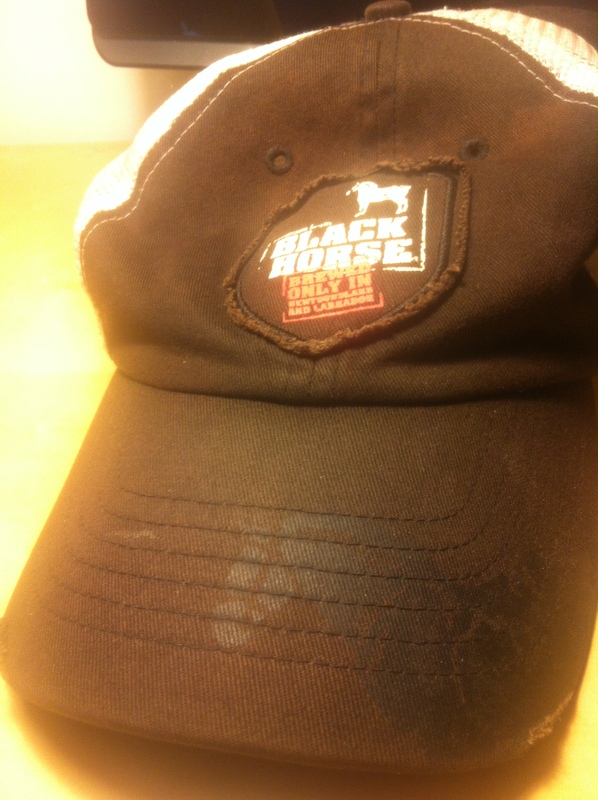 Present-day Black Horse logo, from my well-worn baseball cap. I wonder if the flavour of the two beers were similar and if the brewing of ales and lagers was starting to converge (ales becoming more watery and lagers becoming more bland) so that all beer just tasted like “beer.” Either way, the Newfoundland Black Horse, since at least the early 1970’s, has been a lager. While now it’s marketed as a “premium lager,” its interesting to think how far it’s come from it’s ale heritage. Thoroughbred? I think not. 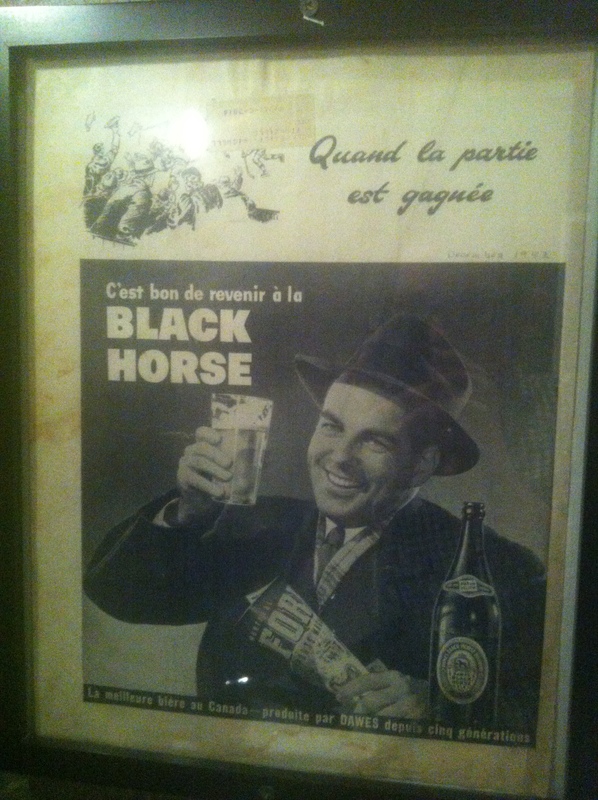 1942 french newspaper advert for Black Horse Ale, framed as art in the Beer Bistro mens washroom in downtown Toronto. 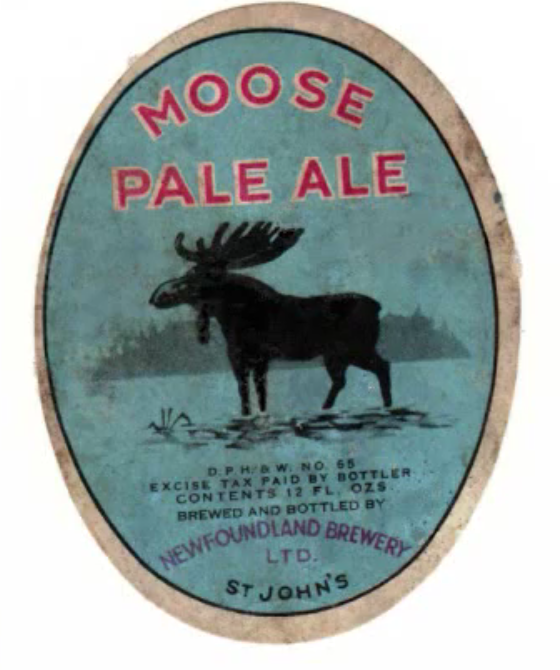 I was re-watching a youtube compilation of old Newfoundland beer labels this morning and I realized that searching for them online didn’t bring up any results. Anyone looking for a history of Bavarian Brewing’s Bulldog beer would be totally out of luck. Here, I’m going to list a few of the brands highlighted in the video. The original video can be watched here on YouTube. It’s not my content and I did not make the video, so don’t blame me if you don’t like the song they use! 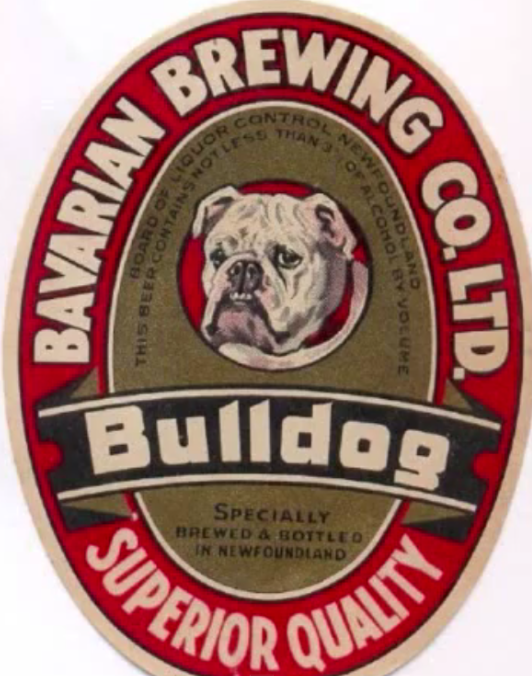 From Bavarian Brewing Company we have Bulldog Newfoundland Style Beer, the Silver Doctor Summer Special, an Irish Style Porter, and their Three Star Lager. 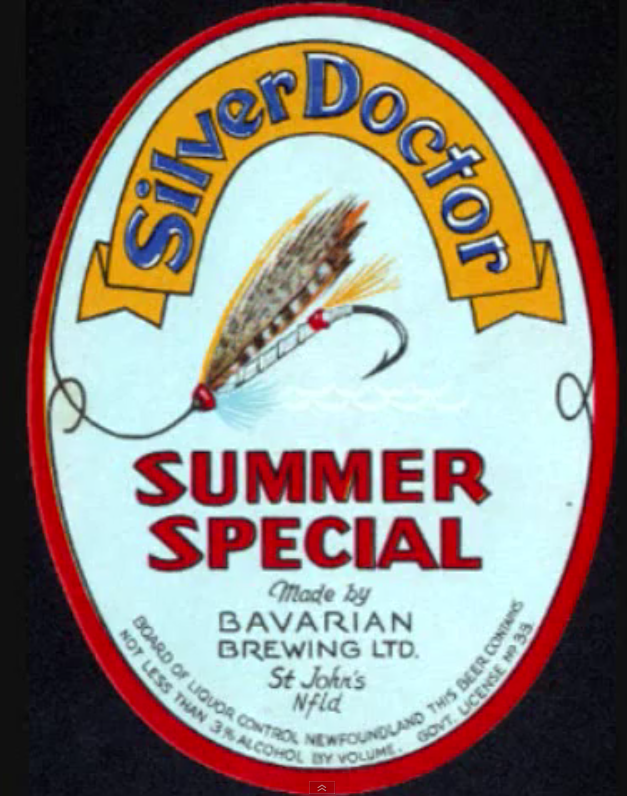 I’m guessing the Bulldog would be an ale, but I have no idea about the Silver Doctor. Sounds good! From Newfoundland Brewing we have Moose Pale Ale, their Old Stock India Pale Ale, “India’s Holiday Bock Beer,” and a Red Top Golden Amber. These all sound amazing. Moose Pale Ale! How Newfoundland is that? Plus another India Pale Ale, an amazing 8% bock (a dark German spring beer), and an amber ale! What a line up! 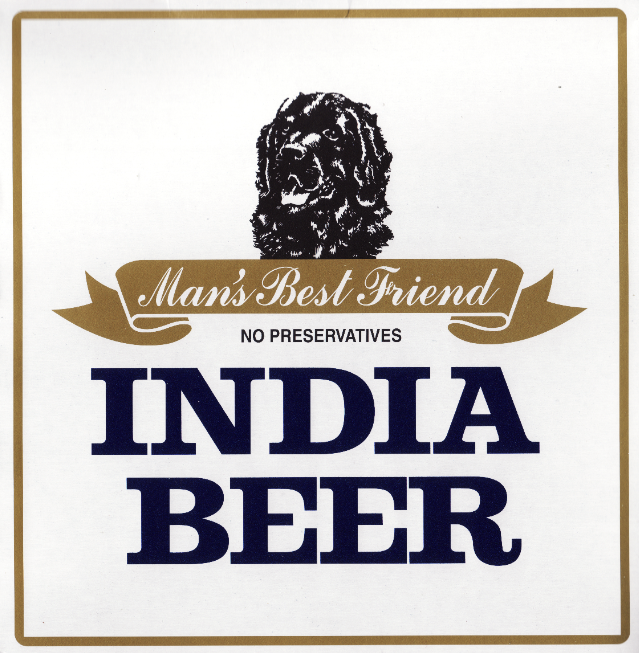 India’s Holiday Bock Beer (Newfoundland Brewing) – 8%! From Bennett Brewing we’re just missing Bennett’s beer. I love that green-and-black colour combination. From the short lived Bison Brewing (in Stephenville) we have their flagship beer, Bison Beer. While they are harder to find, it’s important to remember that these old breweries didn’t just produce the scattered few brands that the big Canadian Breweries kept after 1962. They had a full line of beers for all sorts of different preferences. Plus, they are really beautiful labels! 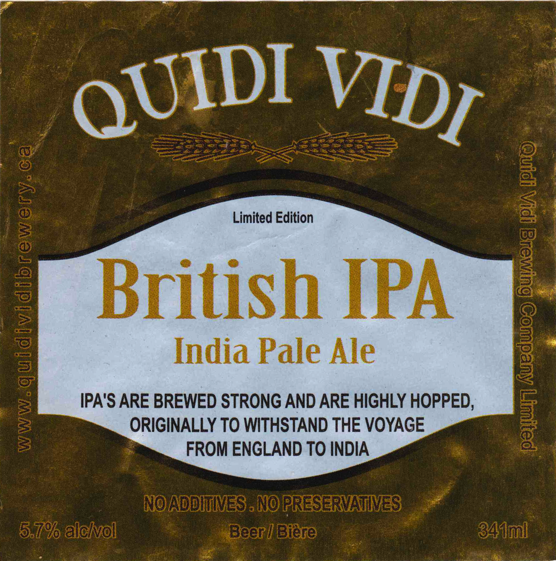 So a few posts back I mentioned that Quidi Vidi Brewing brought the IPA style back to the island after a far too long hiatus. IPA’s are one of the most popular craft beer styles in North America, so it’s really about time Newfoundland started to catch up. There are several varieties of IPA, the more popular style is the American West Coast IPA which has big fruit and floral aromas from the hops, while the British is slightly more malt-centered with a rich, citrus-copper bitter finish. I am very fortunate to have a friend who was willing to ship eight bottles up to Toronto so I could give it a try. I don’t want to discuss the taste to much on here, it’s not the function of this blog to review beer, but I strongly suggest that if you are in Newfoundland then you should to drop down to the brewery and pick up at least a 6 pack! It’s exciting to see beers coming from Newfoundland with a more pronounced hop character. 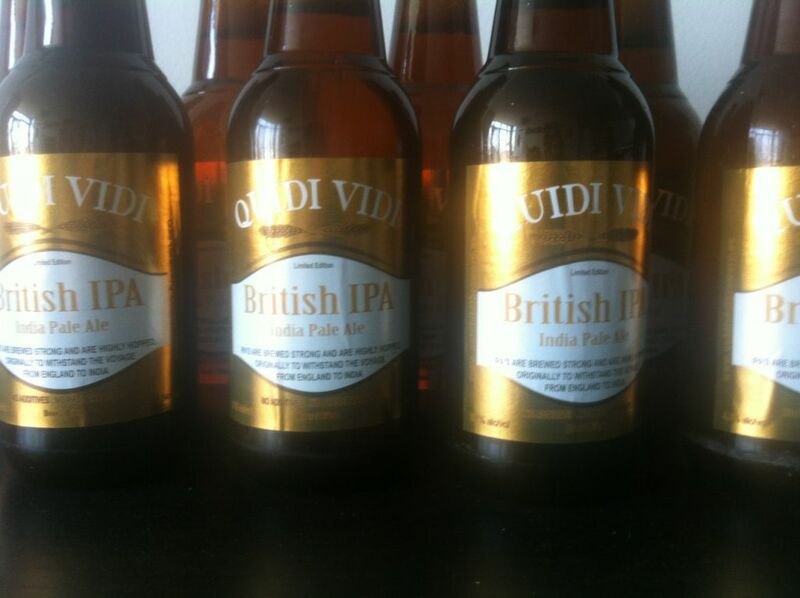 This is more about current events than about brewing history, but I am happy to announce that Quidi Vidi Brewing are bringing the IPA style back to the island. No IPAs have been brewed commercially (as far as I know) in Newfoundland for home consumption (though Yellowbelly’s Hodge Podge seasonal was close) since the end of the “India Pale Ale” by Newfoundland Brewery (excepting homebrew, of course). This is a British IPA, not a more America hop-heavy version, about which they state: “IPA’s are brewed strong and are highly hopped originally to withstand the voyage from England to India.” While I’m not in Newfoundland right now I do have some pictures provided by my folks. 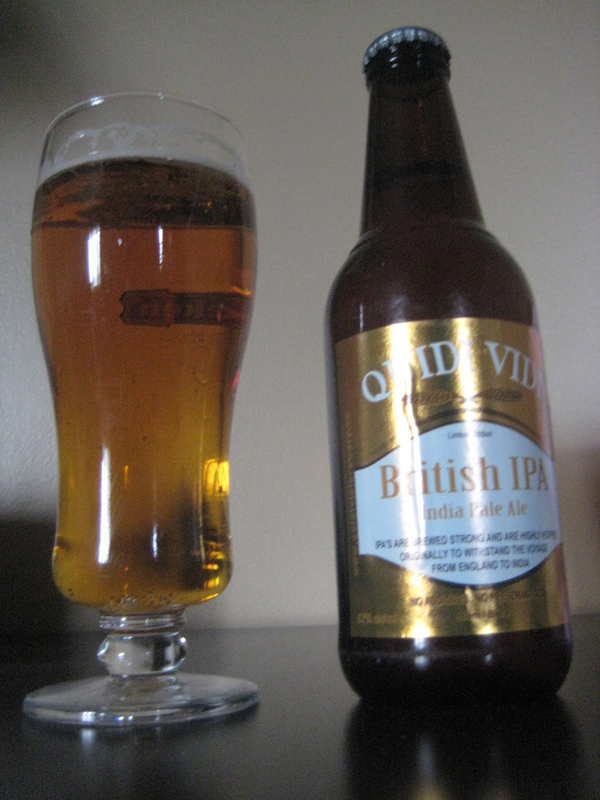 A picture of the Quidi Vidi British India Pale Ale seasonal, circa March 17, 2012. 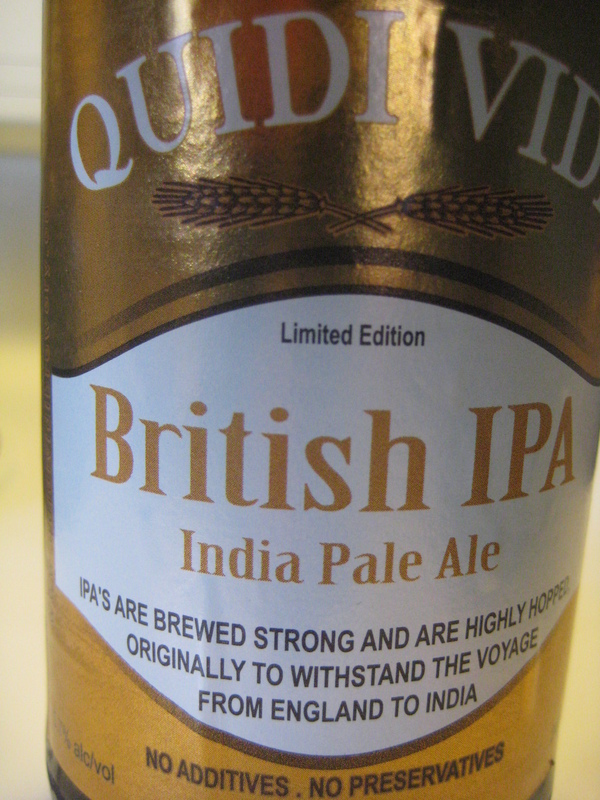 A close up of the British IPA label, circa March 17, 2012. If all goes well I might have a couple of bottles to sample in Toronto later this week. If that happens I’ll update with some thoughts on the taste and a high-quality label scan. Hopefully it’s hopped enough to survive the voyage up!